SUVA (The Fiji Times/Pacific Media Watch): Fiji faces a critically important general election next month, the second since the return of democracy in this country in 2014. These were the words of Professor David Robie, director for the Pacific Media Centr at Auckland University of Technology, as he urged governments in Fiji and the Pacific to take into account the important role journalists play during an election. “Journalists are guardians of democracy and they have an important role to play in ensuring the legitimacy of both the vote and the result,” said prof Robie, keynote speaker at the 18th USP journalism awards. He said this was important, especially for a country like Fiji which has been emerging from many years of political crisis. “It is important that journalists play their part too with responsibilities as well as rights. "Along with the right to provide information without fear or favour, and free from pressure or threats, you have a duty to provide voters with accurate, objective and constructive information." He praised the role of the University of the South Pacific in contributing towards journalism education in the region in a wide-ranging talk about "media phobia". Dr Robie was former coordinator of the journalism programme at USP and mentored the current coordinator Dr Shailendra Singh, who has been steering Pacific journalism education for many years. 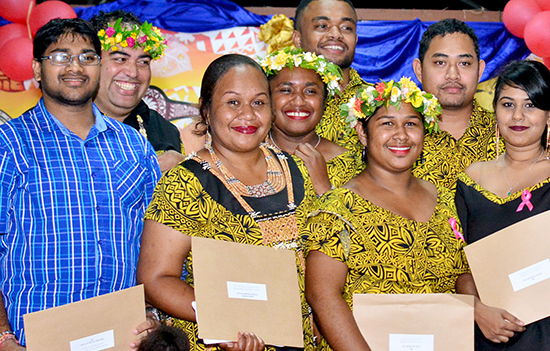 Jessica Savike reports for The Fiji Times about the reflections of Elizabeth Osifelo of the Solomon Islands, who jointly won the Tanoa Award for most outstanding journalism student. "Staying away from my family for three years was the sacrifice I had to make," Osifelo said. She shared how she had missed her family and husband who are back in her home country. Osifelo said she was always reminded that no matter how far away her family was, she was still close to a Pacific family at USP. The 34-year-old said she had chosen to study at USP because it was a regional organisation closer to her home and she believed that this was the best choice for her. Osifelo plans to return to the Solomon Islands after she graduates. She said she would see what prospects unfold in the Solomon Islands when she returns and she hoped to join a media organisation there.